It turns out Star Trek and DC Comics didn’t lie to us after all. There are alternate universes out there, somehow existing parallel to our own. In point of fact, there are twenty-two such universes, but the mysterious Arkan has been closed to outsiders for decades. Kiril Maksimov has been recruited to serve as a gatekeeper and custom-taker for those traveling between universes. It sounds like dreary TSA kind of work, but apparently it requires a special touch. 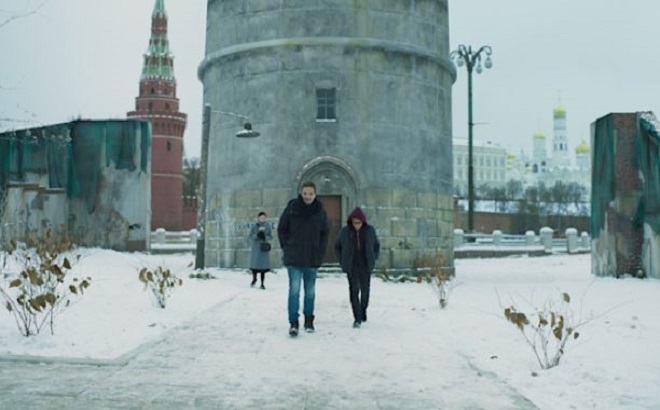 Regardless, he has a hard time leaving his old earthly life behind in Sergey Mokritskiy’s A Rough Draft (trailer here), which screens during the 2018 Fantasia International Film Festival. Maksimov is on the brink of superstar status as a video game designer, when suddenly he turns into Thomas Veil from Nowhere Man. All records of his existence are erased and none of his friends and family recognize him anymore. For good measure, the shadowy cabal also frames him for murder. Then they lead him to a creaky old tower, hiding in plain sight a stone’s throw from the Kremlin. This will be his new home, where he will facilitate travel between the universes, as part of the “functional” class. One universe is a lovely beach front world. Another is a steampunky analog of Romanoff Russia, which apparently is a charming place for afternoon tea. There is also a Stalinistic Gulag universe, where difficult functionals get sent. The big question is: what is Arkan really like? Supposedly, it is a lot like our world, but a few years ahead, so we could learn from their mistakes. Arkan could be the rough draft for our universe. Unfortunately, Khrushchev had the passage connecting our universe and Arkan destroyed when it looked like “Rightists” were on the verge of taking over there. Now the elites of the multiverse are eager, even desperate to observe current developments in Arkan, so if Maksimov can figure out a way to “open a door” to the lost universe, it will justify all the trouble they took installing him. Rough Draft is consistently intriguing as an example of Russian science fiction, even though its narrative is patchy and inconsistent. Obviously, the charm of the Czarist universe and the dystopian grimness of the Gulag universe say quite a bit about the last one hundred-plus years of Russian history. Tellingly, Arkan becomes a black box that holds some vastly disparate ideological speculation. There is no doubt the alternate universes of Rough Draft resonate on an archetypal level. The problem is the rules for interdimensional travel seem to constantly change, as do the powers of the cabal that hold Maksimov in check. The editing is also pretty rough, allowing characters to just magically turn up in places. As Maksimov, Nikita Volkov is not exactly the second coming of Stanislavski, but he is probably adequately luggish. Likewise, Olga Borovskaya is mostly just serviceable as Anna, the woman Maksimov can’t forget, even though she has been made to forget him. Easily, the most memorable, screen-grabbing work comes from Severija Janušauskaitė as Renata Ivanova, Maksimov’s initial recruiter. A Russian film that warns of oppression at the hands of oligarchical authority figures is always notable. Frankly, it is a little like warning there could be rain in Seattle. It is probably already too late, but the gesture is still appreciated. Mokritskiy also creates some striking visuals and the special effects are way better than the stuff of other recent Russian sf movies, such as Attraction and particularly the cheesy Guardians. If you are seeing many films at Fantasia than it might worth catching Rough Draft to satisfy whatever curiosity you might have, but as a film considered on its own merits, it just doesn’t hold together. Choose accordingly when A Rough Draft screens again this Friday (7/27), as part of this year’s Fantasia.